When I was not acknowledging and pursuing what I really wanted to do , I was jealous. Jealous because, often secretly, but not always, I knew I could do an equal or even better job than those I was jealous of as I watched their successes unfold. Of course, it took me awhile to realize that what I wanted to do, to be who I truly was underneath the stuff I did to please other people and to conform, was my ability to not be jealous and my ability to make the choices that were right for me. Getting my own life on the track I wanted it to be on has not been easy and has, in fact, been more difficult because of how far off the track I became trying to make people happy. Funny thing is, they never were never satisfied or happy anyway. Their expectations and wants were like leaves blowing in the wind and so much depended on the wind … forces out of their control. Would I make the transition again if I could do it all over again? Yes, but more importantly, the big part of me that has always wanted to help people, is now better at helping people because of two things … sharing my story, plus providing the inspiration to not do what so many of us have done … lose our dreams and our identities … because the price individuals and all those they impact pay is high. The price paid impacts negatively the quality of our health, happiness, success, resilience, and compassion. The price paid creates small, limited thinking often accompanied by hurtful words and actions. The price paid is self-destructive. So, take a moment or two or however much time you need to examine who or what you are jealous of and then take the steps to get off that treadmill and walk your own path. For yourself and everyone else, this will be your grand gesture of respect and love. For all those who have lost their lives to violence, may you know you are in our thoughts and prayers, plus in our efforts to overcome darkness with light, evil with good, hate with love, and violence with peace. Physical and mental discipline, creating terror in someone’s heart and mind will never create obedience. Instead, in animals and people, threats and violence will always create fear and even hate, which will backfire and be lashed out on someone, though not always the discipliner, but someone or something else they will target to process their pain and anger. Whereas teaching and motivating encourages people to choose to do the healthy, good, and right things. But then of course, people who don’t want the good, the healthy, and the right choices because of their low “Respect Level” for themselves and others will always choose brutality to get what they want … which is never about respect or love, but about control, dominance, and disrespect for life. It is a belief system that keeps humanity barbaric and is the barrier to humanity’s evolution as a species. It is also a belief system I believe we can change for the better through education, entertainment, and inspiration. 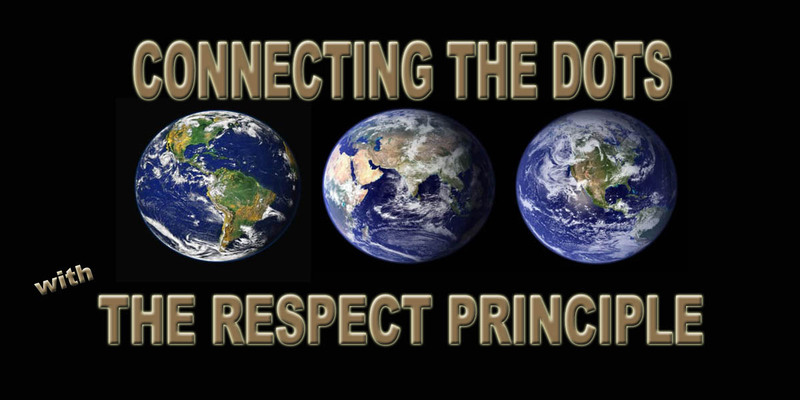 And that is the goal of the Connecting The Dots With The Respect Principle concept, company, and global initiative. Thoughts, best wishes, and prayers today for all those venturing into the academic institutions … may your education be enlightening, your social experience engaging, and your safety a priority. Take care of yourself, help others when you can, and have safe fun! 1, 2, and now 3! 1. Canadian Passport … Check! 2. American Internal Revenue Service … Individualized Tax Identification Number … Check! 3. American Visa for Entrepreneur … Next! Amazing what can happen with faith and focus! Amen! Thanks for all your encouragement and help to raise the standard of living and quality of life of all people, starting in California where the richest, the poorest, and many dedicated to creating positive change globally live … and will be living.